Final week and was pretty good to be honest. I avoided the usual Monday night swim in order to rest. Tuesday was a physio session and as my achilles has been quite good I had a full leg massage instead. This meant no running on Tuesday, another gold star! Wednesday was the GreenlightPT swim session. I still went as I needed to do something but dropped down a lane so that the distance and intensity was reduced. Only problem with that meant I had to lead the lane, which meant clock watching and counting reps – not my forte! I’m used to hanging at the back of my normal lane leaving five seconds after the person in front and swimming as far as they do. Anyway, it was a good session and felt refreshed at the end of it. On Thursday I met the gang for an early lap. We ran this at marathon pace which was great, just the confidence booster I needed. That was me done. I took annual leave on the Friday so I could get packed up for Sunday and just rest although I ended up doing some shopping and housework so didn’t really pan out as I had planned. Saturday was travelling to London and the expo to pick up my number for Sunday. I met a few DLRR team mates there and found out I’d just missed Liz Yelling and Iwan Thomas. Expo was still good though – loads of freebies and things to try or have a look at – there was an opportunity to spend a fortune but we came out with a VLM mug, bear and t-shirt – it could have been a lot worse, especially as it was Saturday afternoon and many of the stands were introducing massive discounts on stuff. Just a quick post before I go to bed in readiness for our trip to London tomorrow. It’s been a long old journey to get to the start line on Sunday and there were quite a few times when I did seriously think about throwing in the towel. It’s a good job that the London Marathon don’t open their deferral window until March else I’d have probably applied for mine back in February. Good job I didn’t though as by somewhat of a miracle it all seems to have come together just in time. Not only have I managed to overcome my achilles tendonitis, I seem to have hit a bit of form in that I actually feel in better shape than last year. The proof will be in the pudding on Sunday but I have a game plan that I will stick to – I promise! A lot of the reason I’ve made it this far (apart from my own bloody mindedness) has been the support of those around me, my ever present husband who puts up with all my moans and groans, my constant stretching whenever I find a wall or a step and child care early on a Sunday when he’d much rather be in bed asleep so I can go out and run! My club mates at DLRR have also been fantastic, they’ve picked me up when I’ve been down, chivvy me along to make sure I make the most out of my opportunity and reign me in when I have random plans to run a speedy Parkrun two weeks before London! See guys, I do listen and heed your advice. The camaraderie at the club is fantastic and if you’re ever unsure about joining a club – do it, you wont regret it! So, how did I get there over the last 16 weeks? The events in Boston on Monday have affected all runners around the world. The marathon is our playground and attempts were made to destroy that. 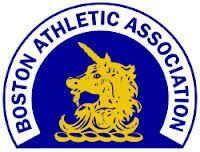 On Sunday morning at 10am there will be 30 second silence for the people of Boston. I will be standing on the start line on Sunday, standing tall and proud for Boston – we will remember them. I attended the usual swim session on Wednesday with GreenlightPT with the plan to go down a lane so that I could keep in line with the taper – no such luck, stayed in the top lane and completed a tough session, just a touch under 3km. I really can’t wait to do a triathlon now to see how my swimming has improved. Thursday I met the guys and gals for an ‘early lap’ we deliberately didn’t go all out but it still got progressively quicker and wasn’t that much slower than the previous week. I was then very good and rather than go on the social run, which would normally work out at least another 5 miles, a couple of us went for a quick 1.5 mile run. Only trouble was the heavens opened and it didn’t just rain, it was a deluge and I haven’t been that soaked since the MK marathon last year! It was a rather tough 1.5. miles but doing that rather than the social run meant I kept my mileage down for the week. This weekend was the last long run. The route planned by this weeks club routemaster was somewhat of a tour of the hills of MK, perhaps not the best run to do as a last run before London but there were plenty of drop out points so I bailed out after 7 miles and then ran the last three miles back to DL at race pace. 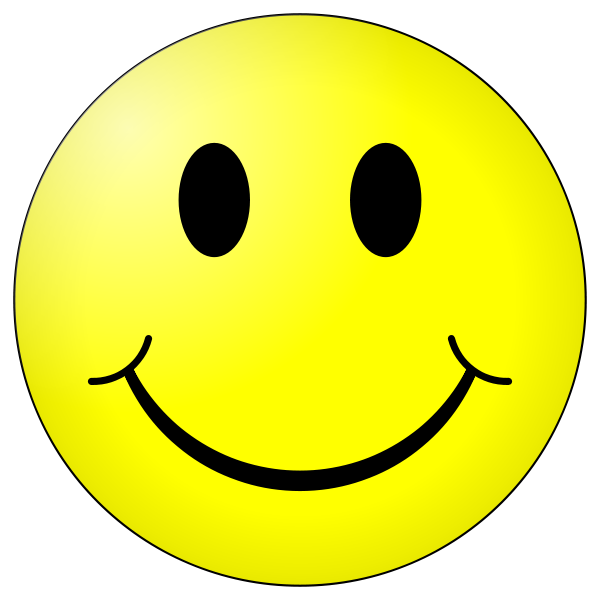 So after 15 weeks of injury, recovery, relapse, more recovery, illness, rebuilding and eventually almost a full return to training, I’ve actually made it to race week – woohoo!!! The miles have started to drop off now as I start to taper for London. I didn’t manage any cross training this week although not by choice. As Monday was Easter Monday the pool was shut in the evening and on Wednesday I wasn’t feeling too good so the upshot was no swimming this week. Now that all my injuries and niggles seem to be on their way out I did contemplate some intervals on Tuesday, but the sensible voice in me determined that this was probably not the time to start 400m reps after three months of steady running – it would probably have ended in tears, so I decided to do a 3 mile progressive run, the first one at marathon pace then each mile 20 seconds quicker. On Thursday I met the early group for our 4 mile ‘early lap’ and not quite sure what got into me but I was flying and felt really good. In fact all of us ran really well – just pushed each other along, so much so the final mile was a 7:17! I haven’t run a mile that fast in years! Overall the time was only just over 10 seconds off the fastest I’ve ever run on that route and at the end I still felt there was some left in the tank – I even went out on the main club run afterwards and that too was one of the quickest I’ve run that route. This is all great confidence boosting stuff. I feel that I’ve managed to get some of my flat speed back, but I’m conscious the long runs I missed in January and February mean my basic endurance is still a bit lacking. Two 20 milers in two weeks will have helped loads but with only two more long Sunday runs to go I’m not got any chance of pushing the endurance further. This was my highest mileage week so far and probably will be of my marathon training this season. After the 20 miles in the snow last Sunday, I actually didn’t feel too bad the next day and the long swim that evening really helped ease the muscles. We still didn’t get the full hour in on the swim session so I’m pretty confident that I can swim at least 3km in an hour. I could really do with an hour and a half session to get at least 4km in, just for piece of mind really with the 5km swimathon coming up but pool opening times and other commitments are limiting me at the moment. Tuesday held a visit to the physio. My achilles has little pain now although it does feel tight now and again so it’s a useful session to loosen it up plus with my knee a bit niggly I’m keen to keep on top of it. They had a quick look at my gait and seems most of my niggles over the past year are due to flat feet and even stability shoes aren’t doing the job. Post marathon it looks as if orthotics may be on the cards, but to get me through the next few weeks with as few problems as possible, I have more padding in my shoes to try and alleviate the problem. It was a tough physio session, perhaps the most brutal so far. I did go out for an easy run (an agreed compromise with the physio) but part of me wishes I hadn’t as it was hard work and still quite slow. Wednesday was swim training. Slightly different session to usual with pyramid sets but felt really strong for most of it. I’d had a rubbish day at work and it would have been quite easy to miss it but I am always glad I’ve been afterwards and boy do I sleep well on Wednesday nights! Thursday night I met a few guys at the club for an early 4 mile loop. I thought I’d give my new trainers a go, with the insoles from my old trainers (plus padding) to ease the transition. I wasn’t sure how I would run but we agreed about 8:30 pace which was still quite fast for where I am at the moment but thought I’d wing it. Well, the first mile was 8:30 ad then got quicker and quicker finishing with a 7:46 – quickest mile I have run since before Christmas! Just goes to show, sometimes you need to be pushed outside your comfort zone! That gave me a bit of a boost for the second main club run and I thought I’d carry on in the same vein and run it reasonably hard so that I got some sort of a reasonable tempo run in. With loop backs I managed a further 5.2 miles. I decided with four Sundays to London I could afford another really long run so felt 20 miles would be about right. I’ve been a bit naughty and not had a recovery week as you’re supposed to but felt as I’d had to build up really slowly I could probably manage another week before I cut back. The main club run was due to last about 2 hours 35 minutes so I figured I’d need to do a bit on my own at the end. I felt really comfortable the whole way round and averaged just under 9 minutes a mile for 20 miles. This included several shoe lace stops and a stop at the car to refill my bottles when I forgot to stop the watch, so possibly a bit quicker still. My penultimate mile was an 8:30 so it would seem still have something in the tank for the last six miles when they come and am actually now running better than I was this time last year…just got to stay healthy…. Still building on the good work last week but with one little glitch. I was quite tired from the 18 mile run last Sunday so decided to give the Monday night swim session a miss so the first bit of training this week was a run on Tuesday night. So far most of my running has been easy or at best steady with no variety, mainly because I’m trying to manage my injury and also because I don’t feel confident about doing anything beyond straightforward running in fear of causing any more damage but I decided to throw caution to the wind and try some intervals for a change. Nothing too fast or short but just something to mix it up a bit so I went for 4 x 1 mile not for any set time, just to stretch my legs. None of the miles were particularly quick, perhaps marginally quicker than a couple of miles in the half a few weeks ago but that was about it. Only problem was I started to get a bit of a niggle in my right knee. It feels a bit like the infamous ‘runners knee’ that most people get at some point. No real pain as such just discomfort. I suppose it might be result of my right leg compensating for my left leg and I do have padding in my left shoe so might all be linked. But some icing seemed to help and I thought no more of it. On Wednesday I helped out with the beginners group at work. They’re split into groups according to how far they run and I took out the most advanced group who ran 5km. It was a nice run with a chance to chat while running and got a few more miles on the clock. Both my knee and ankle felt ok so I wasn’t too worried about either. Wednesday night (get me, a two session day – and I did a full 9 hours at work, plus a DLRR MutliSports meeting!) was the usual GreenlightPT session. As well as the warm up was a 12x100m set – hard work but still got a good bit of rest as the end of each rep – looking good for the tri season – not that I’ve booked anything up yet. I couldn’t run on Thursday as the other half had to go out but I did plan a quick run on Friday. As it turned out by the time I’d finished work and popped to Tesco it was pouring down, almost verging on sleet so decided another rest day wouldn’t hurt, especially with the Oakley 20 on Sunday. The rain on Friday turned to sleet and then snow with lots more forecast, plus icy temperatures and high winds. Upshot was the Oakley 20 was cancelled on Saturday morning along with virtually every other race in the area. It was a shame as it’s a really good race and always a good test. It was also going to be my longest run this year. Not too many weeks ago running 20 miles was just wishful thinking so I was gutted not to be able to run it, but in true DLRR style the Sunday club run morphed itself from a 9 mile off-road run into a three stage epic to enable us Oakley deprived people a chance to get 20 miles under our belts. To do this meant an early start, 6:30 am breakfast, out defrosting and clearing the car ( a couple of inches of snow overnight had frozen solid to the car) at 7:30 am and then the journey to David Lloyd in MK to meet the others. To be fair apart from the roads in the village they were all pretty clear – only dodgy point was getting out the village – up a steep hill covered in solid ice that no other cars appeared have driven over – traction control was having a ball! About 20 of us turned up for the extended run. We ran about 3 1/2 miles to Newport Pagnell to meet the rest of the DLRR crew. It wasn’t too bad running on the snow, much of it hadn’t been walked on so gave a reasonable footing. Normally I’d have worn trail shoes in the snow but 20 miles in them would be pushing it a bit so had to be careful. There were a fair few waiting for us in Newport and had a bit of a cheer as we arrived – a bit later than planned, but 3.5 miles in the snow takes a bit longer than normal! We then followed a great route along the old railway line to New Bradwell and looped back towards Linford Wood before rejoining the old railway line again and heading back to Newport. From there, after a quick group photo – Sunday run tradition – the longer run group set off back to David Lloyd. It was a hard 3.5 miles back, the weather had got colder, the wind more biting and had started to snow again but we all got back in one piece and had at least 20 miles on the clock. I’m not sure exactly how many miles I completed as I’d forgotten my Garmin, and although I’d got my phone and was using RunKeeper, for some reason between Linford Wood and the railway walk it stopped working properly. Based on the route I know we took it was a straight 18.1 miles, but I know I did a fair few loop backs so I’m pretty confident I did the full 20. I’m not used to running ‘naked’ but it was quite liberating in a way as you can’t get hung up on pace or how far you’ve gone. It was nice to just concentrate on running and for a long run like that when time and pace wasn’t particularly an issue that’s perhaps no bad thing…. Anyway – 20 miles (at least) in just over 3 hours in the snow means it’s coming back together. No issues with my ankle, bit sore the last few miles, but so was everything. Knee was a bit sore, but not too bad running, just afterwards but I’m due a physio visit this week so will see if it is ‘runners knee’, and if so at least I can get it taped to ease the pain. Another positive week. Got a good endurance swim in on Monday. Still only got about 50 minutes in the pool but managed a good 100m more than last week. These are relatively easy sets but are more about getting used to swimming constantly for a length of time. On that sort of pace I should be able to get the 5km swimathon done in about 1h 45mins. I took the run on Tuesday quite easy as I had raced on Sunday but did try a quicker mile towards the end although it was still slower than my quickest mile on Sunday. Since I’ve been running slowly deliberately to help with my injury I now have trouble getting up to speed on my own. No bad thing at the moment really with a marathon coming up, but need to get back on it once the 5 and 10km races come up in the summer. Wednesday was the usual GreenlightPT session. It was hard work this week, but we completed 3km made up of a lot of reps, some quite quick (for me anyway!). Thursday was DLRR club night and on the early 4 mile lap it was great to welcome back my running buddy who’s been out injured for five months. Her timing is great as it coincides with me starting to quicken back up a bit too so between us we should start to pick up a bit over the next few weeks but still be mindful of self-preservation. The second run was a bit slow, but it always is with the first two miles steady uphill and loop backs. By halfway though I started to feel quite good and picked up a bit although the legs were tired by the end. 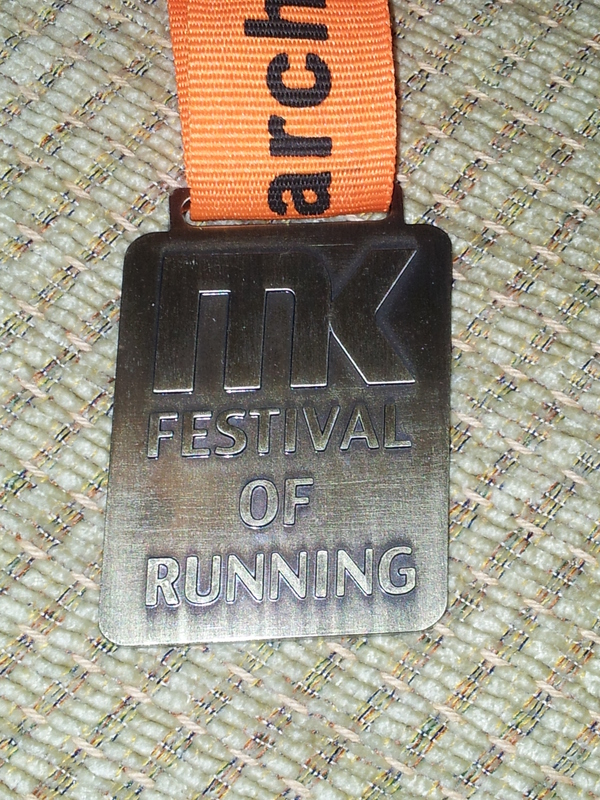 This Sunday was the Milton Keynes Marathon Training Run. This was an organised 18 mile training run with a bit of a talk beforehand with tips for the marathon then two 9 mile laps run covering much of the marathon route. There were also pacers covering every minute and half-minute from 7 to 10 to help people pace their runs. I decided to run with the 9:30 pacer for the first lap then thought I’d quicken up for the second lap, except as usual after a couple of miles, I changed my mind and a group of us ran the first lap at 9:20 pace. I then upped the pace a bit and ran between 8:34 and 9:09 for the second lap. I felt pretty good and managed the whole run in 2:37 which bodes really well for Oakley next week. I think 9 min miles might now be possible which puts me almost where I was last year…finally getting it back together. The MK Half is traditionally cold wet and windy and this year was no different although rather than rain it snowed most of the way round. MK can be quite a windy city and with a route that included Campbell Park and Willen Lake we were never going to escape it. With all my injury worries leading up to today I wasn’t really looking at this as a race, with London looming I feel quite under prepared for the marathon so was hoping to use this as a stepping stone and confidence booster to make the most of the next four weeks before I start to taper (although not sure how you taper when you haven’t done a lot in the first place!). As I’m quite behind with my long runs I planned to do an easy three miles before the race to give me a solid 16 miles for the day. I’d parked in Campbell Park itself and ran down to the canal and looped back round. It was quite slow but everything felt ok so with a quick change back at the car I jogged over to the club meeting point for our traditional pre race photo. We had over 120 guys running in this race and a good 60 turned up for the photo shoot in the ‘Food Centre’. This was right next to the start so it meant we could all stay in the warmth until the final few minutes. The start itself was a bit of a damp squib really, no obvious countdown or klaxon, just lots of people moving in the same direction really slowly but managed to jog over the line and get going. I had planned to take a least the first 8-9 miles at 9:30 pace then see how I felt for the rest, but the first 2 miles was all downhill so I was running at 9 min pace without even trying! All still felt ok so I thought I’d keep it steady for another mile or so and see how it went. The course comes off main roads after about a mile and after a quick jaunt through a housing estate hits the redways of MK. We then rejoin one of the old roads (from before MK took over) and followed this all the way to Willen Lake. Before reaching the lake was the DLRR cheering point where loads of fellow runners and their families were waiting to cheer us on. As a club we really do have the best supporters in the business, it was seeing these guys at this race last year that made me want to join DLRR and so far I’ve loved every minute. The lake was windy, as usual, and with the snow falling was hard work but I hit 6 miles a bit quicker than I’d planned but felt strong. As the route came away from the lake we came into Broughton differently to previous years and ended up with a bit of cross country as the path we should have followed was flooded – quite concerned about my trainers! I had a stop in Broughton to stretch my achilles – it wasn’t hurting but felt a bit tight and as I wasn’t racing wouldn’t hurt to stop for a bit. After the stretch I felt pretty good. As we reached 8 miles and headed back towards Woolstone I thought I’d try to push the pace a bit to see how much my leg would take – quite a bit as it turned out! The pace went up to 8:30 miles and no reaction. I passed the DLRR cheering crew again and then back towards Willen Lake to do a final stretch along the canal before the final mile through Campbell Park. I was passing people left right and centre now which is always a good feeling but decided to not increase the pace any further. I’d proved to myself I could run 13 miles at marathon pace and a bit quicker so didn’t need to do any more. The final mile went back up through the park. It rises gradually for about 800 meters then the final 400m or so is straight up to the Beacon which is the highest point in MK. I normally love hill running so gave it a good bash although I did need to reign it in a bit as hills and achilles don’t really mix. I finished in 1:57, a good 15 minutes off my pb but today was never about racing. I got round in one piece without any after effects and was buzzing. The race itself is ok, I only do it each year because it’s on my doorstep. It’s billed as a festival of running’ but there isn’t a feel like that to the event. Several thousand runners take part and there’s a 10k and 5k race as well but the whole set up doesn’t really have a big event feel. The medals were handed to you in little bags, there were drinks on offer at the end but no goody bag so you’re having to carry it all. They did have space blankets which was a nice touch, but tucked away in boxes that you had to help yourself to – getting one of those wrapped round yourself while holding two bottles and a medal in the freezing cold is no easy task. The route is great. It’s quick and even with the hill at the end many of our club got PBs. My achilles has been feeling a lot better the last week or so, I’m still very conscious of it but with careful management of it I’m still able to increase my mileage without too much of an issue. It’s frustrating not been able to run completely free but I’m in a much happier place now than I was a few weeks ago when I had to seriously consider if London was actually going to happen but with support from the guys at my club and a lot of stretching and icing I think I’m well on the road to recovery – so much so that I think it’s reasonably safe to say – we’re off to London baby! A good week on the training front – all sessions planned were completed and completed well! The Monday swim session went well. We only have a hour as it’s a public lane swim but didn’t manage to get in the pool until 10 mins into the session. I had planned 3x1km but was never going to manage that in 50 mins, but was quite pleased to fit in 2x1k plus 400m – this also included some rest between each set – but each one felt quite easy making the 5km swimathon in April not seem too far a challenge. With the MK Half coming up on Sunday, I wasn’t sure what sort of pace to run so after an easy 2 miles on Tuesday I tried to run a bit harder for the second 2 miles to see what my achilles would withstand – I wasn’t far off 9 min miles so gave me a good indication of where I needed to pitch myself on the day. Wednesday was the weekly swim training with GreenlightPT. The sessions do seem to be getting tougher now, but I think I’m hanging in there and managed to get through 3km in the hour. Really looking forward to doing a triathlon this season just to see how far I have improved in the swim. It’s DLRR club night on Thursday and took a steady 4 miles with the early group, which was one of my fastest for a long while – still a good 6-7 minutes slower than I have done in the past but still feeling good. This was then followed by the main club run which was four miles, but with loop backs I pulled in 4.8 miles. Towards the end I started to feel quite strong and gained some confidence for Sunday. 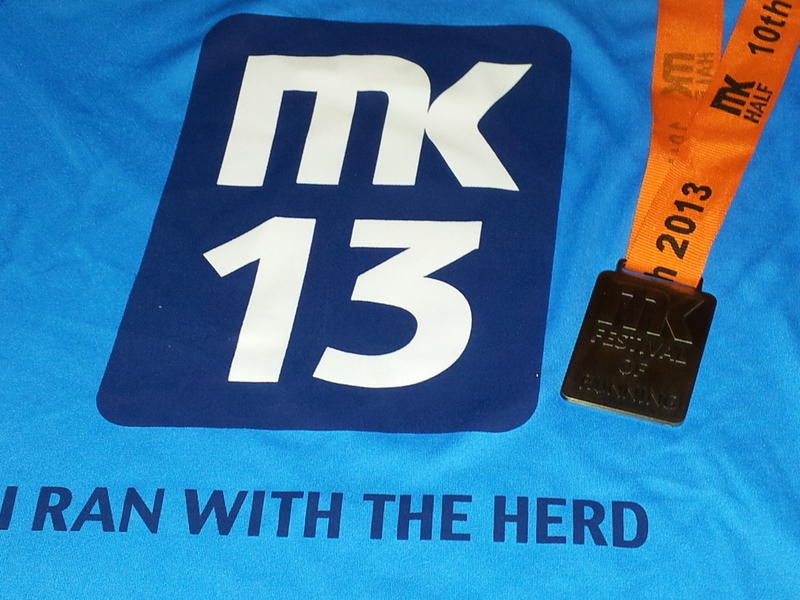 Today was the MK Half, I’ll add a full report tomorrow but in short – whoo hoo!! Planned to run up to 7 miles at 9:30 pace then quicken it up after that – and thought I’d come in around 2 hours. But found myself running at 9-9:20 pace for the first 7 miles, had a slow mile 8 as I stopped to stretch my achilles – just felt a bit tight – and then thought I’d put my foot down to see what I’d got, but still holding back enough not to do any damage. Started churning out 8:30s and was passing people like they were standing still – event managed one of my quickest miles on the final mile which included the infamous beacon hill in Campbell Park (v.steep uphill – just what you need at 12.5 miles in a half!). Came in at 1:57 – with the biggest grin on my face you can get! I had also ran three miles before the start so I could get 16 miles in. The time was no where near my PB but considering just over two weeks ago I couldn’t even run 4 miles without pain, I think that’s a pretty good result! All that’s left to say now is – London – BRING IT ON! This week was a bit of a make or break week. After the disaster of last Sunday’s run London was starting to look like it might not happen, but following the run on Sunday I have diligently followed the icing and stretching programme and took a very gentle run on Tuesday to see how the land was lying. I am pleased to say I got through the run with no ill effects. It was slow but seemed to be ok.
To keep my fitness up I’ve introduced another swim session, but it will also be useful for the forthcoming tri season and the 5km swimathon I’ve signed up for at the end of April. This will be an endurance session to get used to swimming for long lengths of time as I’ve only ever swum that distance once before and it was a while ago (I was 14!). I’ve got rid of the cold/chest infection I’ve had for a few weeks so returned to the regular swim training on Wednesday with GreenlightPT. It was a tough session and despite missing the last two weeks I think I managed to hang on ok – just! There are some quick guys in my lane but it’s a good way to improve. Thursday night is DLRR club night so it was an opportunity to get 8 miles in. I ran the early lap nice and slowly and then ran with the tail runner for the second lap to keep it nice and slow. All went well and that was another 8 miles in the bag. The stretching and icing continued and I decided to give a long run a go on Sunday. As I had managed nearly 11 miles last week I thought it would be OK to try to another long run. With the MK Half coming up next week I wanted to be sure I could at least get that distance covered so I worked out a 13 mile route. I ran part of the old railway as it cuts across north MK and then followed the River Ouse all the way to Old Stratford. It was a nice route, mostly flat but part of it was different to anything I’ve run before which is important to keep the interest going. To make a change I also ran with music. I’ve always been very anti MP3 player while running having had too many elbows in the face and random changes of direction from people running with them in races but as I was planning on running quite slowly I thought it might be a welcome distraction. Surprisingly it was really nice to run with music. I just did a shuffle of everything that was on my phone, forgetting that I’d got three episodes of Marathon Talk on there. As interesting as it is I didn’t fancy listening to it while running so had to make several stops to skip each time an episode came up! The run itself went really well, I purposely started off at around 10 minute miles to ensure I didn’t overdo it but by mile eight I was feeling quite confident and ran the last 5+ miles home at 9:30 pace with no ill effects. I think I might try to run the half next week at this pace – over 1:30 a mile off what I’d normally be running, but this is the long game and the goal is London not a half pb, that can come at a later date. If that feels comfortable I’m going to add an extra three miles on that day to give me 16 which should hopefully put me in a position to do the MK marathon training run of 18 miles the following week. I’m kind of looking forward to running the half at a slower pace – I’ve run the race about 7 times and this is the first one I’m going to run without the aim of a PB – I may as well enjoy it and take in the mini tour of MK!